Better known for their vast range of hand and measuring tools, Goodell-Pratt's miniature lathes and milling machine were very much an adjunct to this business, not a major part of it. The first machine in the lineage was probably a miniature treadle lathe, manufactured by A. D. Goodell at the Millers Falls Factory during the 1880s. In so far as research has been able to determine, by 1905 the sales catalog had mention of only one lathe, the No. 29, this being listed with few accessories. A little later, probably from catalog No. 8, two distinctly different models were available: a "Bench" lathe in Model Numbers 125 and 494 and the smaller "Precision" No. 700. 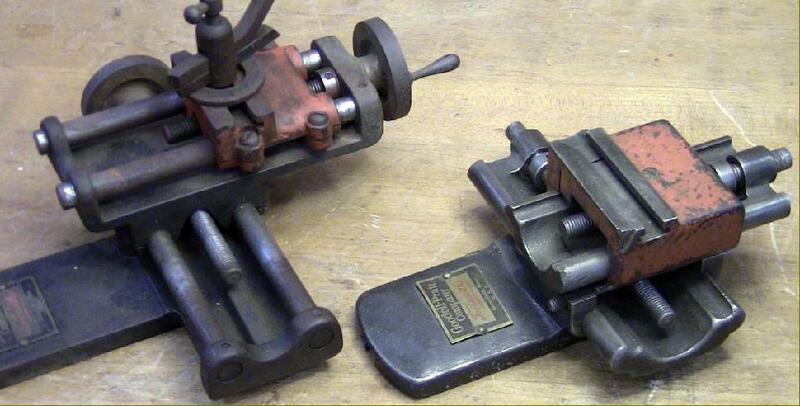 These lathes - or ones very similar - were also sold using the brand name "Greenfield." as the "Precision Lathe No.1" (and possibly as yet un-discovered models with a very fine original example of a "Massachusetts Tool Co. No. 1" found in a boxed set). Started by Pratt in 1900, as a subsidiary of G-P to make precision tools in Greenfield, the Massachusetts Tool Co. had a factory built on land leased from G-P - alongside the G-P plant. Although marketed as simple wood or polishing lathe, a remarkably wide range of accessories was available from Goodell-Pratt to turn the Nos. 125 and 494 into small but useful metal-turning lathes that could hold collets, cut threads and mount a simple milling slide. The 125 had a swing of 7", and a between-centres capacity of 12". It was 25" long overall, stood 111/2" high on its twin feet and weighed 30 lbs. The 494 had a bed some 6" longer, admitted 18" between centres and was fitted with a longer and more robust T rest. In comparison the 700 was a tiny machine; just 12" long, the swing was 5" and the between-centres' capacity 5"; this machine is dealt with in greater detail here. 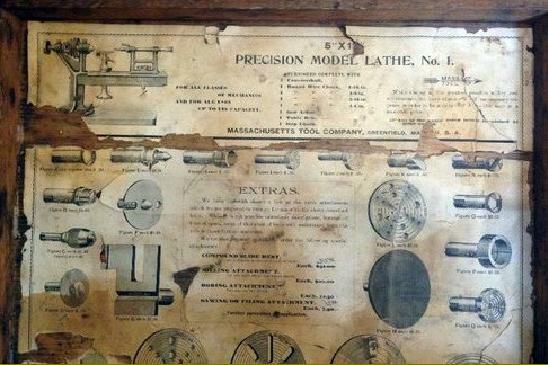 A recent careful study of early catalogues by the Goodell-Pratt enthusiast Michael Bishop has identified three different nameplates across the #125 bench lathe range. He writes: Let's call the nameplates N1, N2, and N3 - and note that there were at least two bed castings used, the change perhaps taking place when the long-bed 494 was introduced. However, the castings appear to have differed only in respect of the end-of-bed support being increased in diameter - though it is possible (on the evidence of a few examples) that a second tailstock variant may have been introduced at the same time, this having an alternate stud offset and the addition of an oiler hole for the acme feedscrew. While the Mk.1 compound slide has only been seen with an "N2" nameplate, the Mk.2 has been found with types N2, N3 and N4 - this being somewhat curious, as the catalog introduction of the Mk.2 compound would place it past the N2 nameplate era, so perhaps the company were just using up old stock. No examples have yet been found of a #125 / N4. The current theory, despite having only a couple pieces of evidence, is compelling enough to reckon that the N4 nameplate was for units produced post-Millers Falls acquisition. The N4 nameplate was very close in style and size to a M-F nameplate on a vintage bench arbor, and a model 29 1/2 lathe has been seen painted in Miller's Falls grey *from the factory*; the paint under the nameplate being the same grey as the body. The tailstock and hand-rest rest accents were in G-P vermilion - photographs from the owner are awaited. Notwithstanding the manufacturer's attempts to dissuade potential purchasers, the lathes were (like the splendid Goodell-Pratt hand tools) beautifully finished. A gloss black was used bed and headstock, vermilion (and sometimes orange) for the other larger castings and the small bare-metal parts carefully polished. Left just as they came off the milling machine, no effort was made to scrape the bed and base of the tailstock together; the 3-step, flat-belt drive headstock spindle was fitted with an adjustable cone bearing, a No. 1 Morse taper centre and, most usefully, bored through to a diameter of 3/8". Later versions of the lathe appear to have been fitted with an improved spindle with a larger bore and a much more useful No. 2 Morse taper; other differences also exist between early and late models and are the subject of an on-going investigation. Generously provided with both lever and screw feeds - someone at Goodell-Pratt obviously used one of these lathes himself - the tailstock was spoiled only by the use of an inadequate No 0 Morse taper spindle. Supplied with each lathe was a small "faceplate" with two slots cut deep into its periphery, an adjustable T-rest, a saw arbor, a drill chuck with a No. 1 Morse taper for the headstock and two Morse centres. No countershaft or drive system was provided, but a new owner could have selected them from the options' list - in reality, being no doubt impecunious, he would have saved some money and made them up himself. Thankfully, small 3-jaw chucks were available - these were always a problem with very small lathes from this era - that screwed directly onto the spindle nose. Because they were inexpensive and modest machines - the basic lathe cost $40 - and invariably suffered rough treatment at the hands of inexperienced amateurs throughout their life - very few Goodell-Pratt lathes appear on the used market in other than neglected condition - and appear to be of little interest to "collectors". Hence, here is the chance for someone with patience and time, but little money, to assemble a perfect, original machine and a complete accessory kit. All the parts must be out there somewhere in the vastness of the U.S.A., possible unpacked, in their original boxes, forgotten in the bottom drawer of great grandfather's dressing table - all you have to do is find them. A detailed appraisal of these lathes can be found here. The same machine but equipped with the optional ring-scroll 3-jaw chuck, compound slide rest - and ordinary tailstock. A handsome nameplate in fine, original condition. With its unusual "curved-edge" ways, the later compound Slide Rest assembly (Part 132), had a longitudinal travel of 3.75" and a cross of 2.25", was described by the makers (in their usual honest style) as a strong and thorough well-made device although not a precision tool. Because the top slide did not swivel on its base, the assembly could not be described as "compound". A long T-slot was provided for the tool holder, which accepted 1/4" x 1/4 bits. At $17, even though no micrometer dials were provided for the feed screws, it was a comparative bargain, the Precision Compound Slide offered for the smaller 700 lathe being more expensive at $85. To get around the problem of the non-swivelling top slide, a Protractor Attachment (Part 639) was offered to fit beneath the slide rest. It was locked by a handle and allowed the slide assembly to swivel 90 degrees left and right from the centre line. The No. 706 Buffing Spindle (know in Great Britain as a "False Nose") fastened to the outboard end of the headstock spindle. Its coarse, twin-start thread was designed to "wind on" and securely hold fabric buffing mops. The Goodell-Pratt Company used the expression "Compression Chuck" when referring to their collet accessory No. 129. A standard range (called "bushings") was offered consisting of: 1/8", 3/16", 1/4", 5/16" and 3/8" sizes. Intermediate sizes were available to special order. The No. 522 Milling Attachment bolted to the lathe bed. Its 7" long table could be moved through 7" cross-wise, 1.25" longitudinally and 1.75" vertically - with all the feeds activated by screws. A very unusual accessory to find in the option lists of so inexpensive a lathe, the No. 128 Turret Attachment had a head just 3" in diameter with six 0.5" holes and a longitudinal travel of 25/8". If the travel was limited to 1.5" or less the head would index automatically; the unit cost $10 more than the price of the basic lathe. The No. 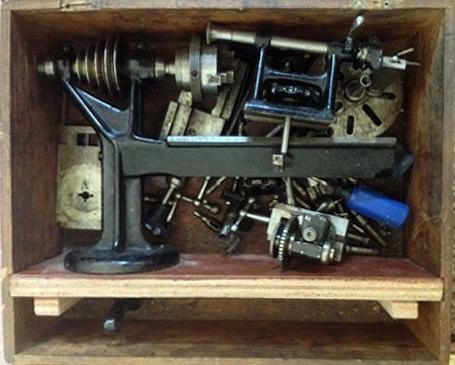 741 Fret Saw Attachment bolted to the lathe bed and was driven from the spindle by the slotted "faceplate" supplied with the standard lathe accessories. The table was 6.75" in diameter and could be tilted left and right and locked in any position. The throat depth was 8.5" and the blade had a travel of 1.5". The six-inch long loop-end saws blades were an extra. The Sawing Attachment was listed as Accessory No. 194 and had a table 8.25" x 9.25" with two slots formed in the top, one of which held a guide for ripping and the other one for cross-cut and mitring work. A screw at the base adjusted the table height and hence depth of cut; a 5" diameter saw blade with a 3/4" diameter hole was recommended. The blade ran between two inset wooden battens in the table top; they could be replaced by a small dado head if required. The unit was finished in red and black enamel and cost, in 1926, $17. 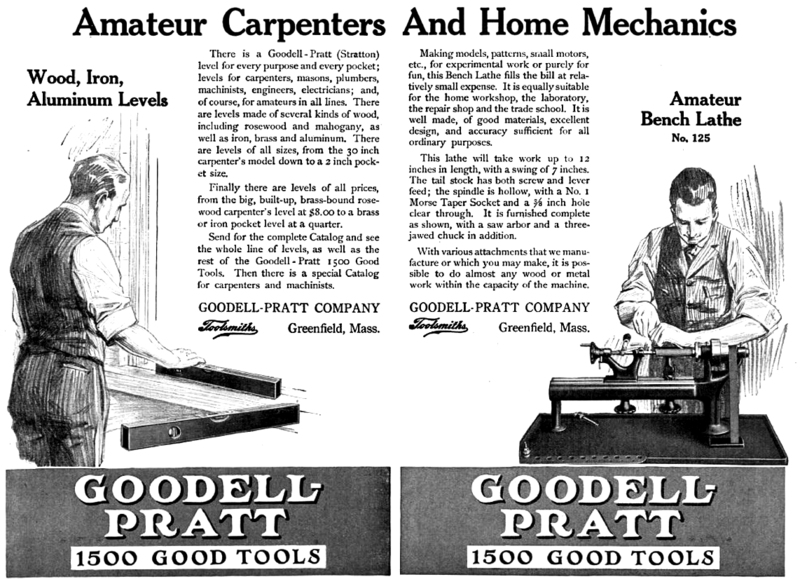 Goodell-Pratt Bench Lathes Nos. 125 & 494. The Screwcutting Attachment, (No. 166) could only be supplied if it was built into the lathe when new. Although just a 24 t.p.i master was supplied as standard, any pitch could be ordered. Simple in principle and easy to use, the method of "chase screwcutting" has been used on lathes since the middle of the 19th century. A "master thread" is attached to or made to rotate with headstock spindle and a guide, held in contact with it, transmits the motion to an adjustable cutting tool engineered so that it can slide along the bedway and impart a copy of the thread to a workpiece held in a chuck or between centres. The system may have been devised by Joseph Nason of New York who obtained US Patent No. 10,383 on January 3rd, 1854 for an "arrangement for cutting screws in lathes." More complex arrangements of the same type have also been used, with trains of gears to vary the ratio between the master and generated threads - that fitted to the American precision Waltham lathe being a good example. The Goodell-Pratt countershaft unit was of the "Fast (or tight) and Loose" type where the drive belt, from a treadle assembly built into the stand, or a separate "foot motor", could be run at idle on a pulley which spun freely on the main shaft. Shifting the belt sideways caused it to ride onto a fixed pulley which then turned the spindle and the 3-step lathe-drive pulley permanently locked to it. The advantages of this arrangement on a human-powered machine were few, and only when motorised would the full benefits have been realised. The bearing were very simple - just hardened steel pins pressing into countersinks formed in each the end of the pulley's main shaft. An original countershaft unit clearly showing the simple bearing arrangement with hardened steel pins running in countersinks in the end of the mainshaft - and a spring-assisted belt-shifting fork. The oil hole for the "loose" pulley is clearly visible. The Goodell-Pratt lathe stand (No. 121), called by the makers a Foot Power Table, was made entirely of iron and steel and provided with a rear-mounted tool tray with 11 small and 12 large holes - it was designed to take only the No. 125 lathe. The lipped-edge tray, legs and treadle were finished in black and the wheel, with its polished rim, in red. The 125 had a swing of 7" and a between-centres capacity of 12". It was 25" long overall, stood 111/2" high on its twin feet and weighed 30 lbs. More photographs here. The 3-step flat-belt drive headstock spindle was fitted with an adjustable cone bearing, a No. 1 Morse taper centre and, most usefully, bored through to a diameter of 3/8". Later machines were given a larger bore spindle with a No. 2 Morse taper. The Slide Rest (Part 132), with its curved-edge ways, had a longitudinal travel of 3.75" and a cross of 2.25", was described by the makers (in their usual honest style) as a strong and thorough well-made device although not a precision tool. Because the top slide did not swivel on its base, the assembly could not be described as a proper "compound" slide. Unfortunately the unshielded slide rest feed screws were not square or Acme form but just ordinary threads and with no covers to protect them from the ravages of swarf and dirt. Although shown in this picture with just a screw-feed spindle the tailstock was generously provided as standard with both lever and screw actions (someone at Goodell-Pratt obviously used one of these lathes himself and realised the advantages) but the tiny 0 Morse taper would have been a serious limitation when trying to do real work. A genuine Goodell Pratt ring-scroll 3-jaw chuck for a Model 125 lathe. Accessories for the Goodell Pratt 125 lathe: turning tools, double-slotted catch (drive) plate, ring-scroll 3-jaw chuck, various centres and a hand-turning base with long and short T rests.